With no more information than this, experienced cattlemen would be greatly impressed with Fujiko. But there is far more to say about this rare treasure. 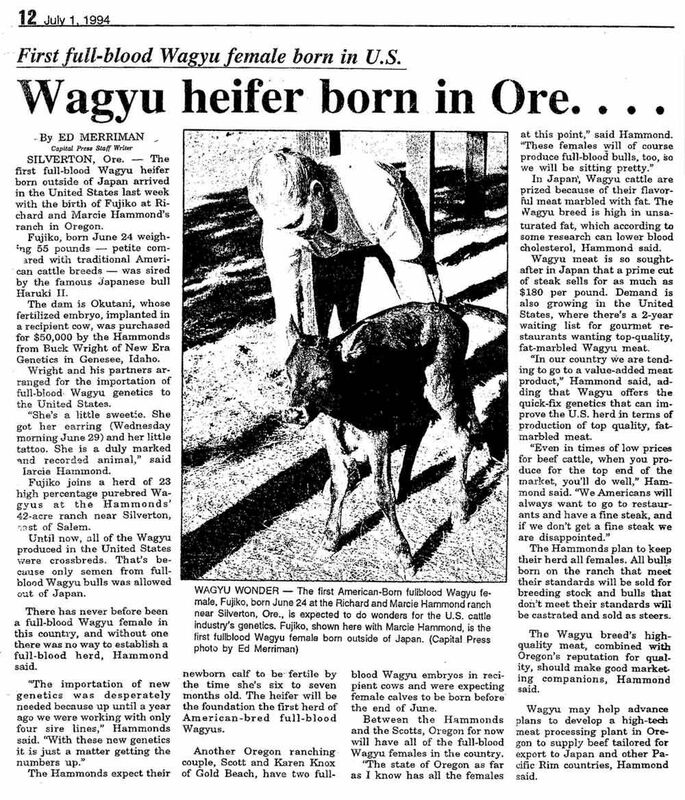 Okutani, Fujiko’s mother, was one of three young, closely related heifers imported into the US together. These three, Suzutani, Rikitani, and Okutani, were especially valuable because they each combined both the “Doi” and “Nami” blood lines. All three descending from Shigeshigenami, doing a search of Shigeshigenami offspring that were imported, you will find only four individuals, the three heifers above and Itoshigenami. The “Nami genetics are famous for finer marbling than other strains. One thing that makes Okutani unique even in this elite group is that she alone also descends from the most famous sire Dai 7 Itozakura which seems to give her a maternal advantage over the others. Due to the tremendous value placed on the embryos from these three heifers, (the recipients carrying their embryos, cost $50,000 each) very few were able to obtain offspring from these select females. There were five daughters registered to Okutani, Fujiko is the only one still living in the US. Fujiko’s sire Haruki-2 is also extraordinary, he is thought by many to be only from the Tajima strain, careful study however shows him to be a blending of several stains, which created a truly powerful individual. When you look for balanced genetics with high levels of performance in multiple traits you can not overlook Haruki-2. Many breeders believe single trait selection generation after generation has resulted in cattle that are out of balance. In both the US and Australian evaluations, you clearly see the genetic power of Haruki-2, where in both summaries he improves both carcass traits and growth traits. In the Australian Sire Summary Haruki is a trait leader in six different traits. Among high marbling bulls that improve growth and muscling he has no equal’s period. No other bull is as complete, no bull is even close. A few astute breeders, to their credit, have begun to use Haruki-2. With the cloning of Fujiko this incredible, proven genetic combination can be your opportunity to have something truly special. Chris Bryant of Reserve Cattle Company purchased Fujiko’s DNA , and recently ,successfully cloned a Calf in Missouri.